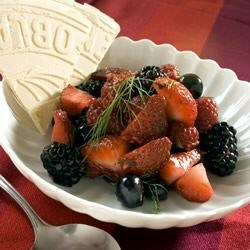 "A wonderful dessert using fresh summer berries." In a large bowl combine strawberries, blueberries, blackberries, raspberries and currants. Sprinkle with sugar and gently stir in fennel. Refrigerate for about 20 minutes. Serve cold. Start your day with a yogurt parfait with lots of fresh fruit & crunchy granola. A light, refreshing summer dessert. Great with whipped cream or without. This is an excellent for a low fat, low sugar diet with a melody of taste sensations. The fennel was so subtle that it had more visual and textural impact than flavor. Still, a nice, simple, elegant way to serve fresh fruit. A definite hit. A wonderful lite end to any meal. I don't like raisins, so was leery of the red currants. They were fantastic in this dessert. This is very good, although not particularly special. Try it again when red currants are available.